The San Miguel Beermen just totally changed the complexion of this series after winning Game 5 of the 2015-2016 PBA Philippine Cup Finals. For the second straight match, San Miguel Beer took Alaska to overtime and dominated, cutting their series deficit to 3-2, but, more importantly, seemingly swinging the momentum permanently over to their side. 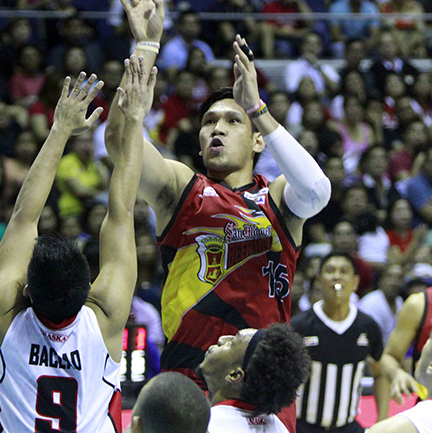 June Mar Fajardo surprised many by suiting up and playing in Game 5. The San Miguel Beermen, bolstered by the return of their MVP Juqne Mar Fajardo, kept their title hopes alive after trouncing Alaska, 86-73, in overtime to extend the SMART BRO PBA Philippine Cup Finals on Wednesday at the SMART-Araneta Coliseum. San Miguel dominated the extra period, opening it with 11 straight points to put the game beyond reach and clinch the victory, their second straight in the title series after losing the first three. Arwind Santos had a huge night with 22 points, 16 rebounds, 4 assists, 3 steals, and 4 blocks, while Fajardo scored 13 points in under 17 minutes of play for the defending champions. Alex Cabagnot added 12 points and Marcio Lassiter had 11. Chris Ross had 8 points and 7 assists while making some big plays in overtime. The Beermen get a chance to tie the series in Game 6, which will be played on Friday. Vic Manuel did well for Alaska again, pouring in 25 points on top of 13 rebounds, while Calvin Abueva and Chris Banchero paired up to score 22 markers. The Aces’ starting unit was atrocious in this game, scoring a total of just 14 points. Vic Manuel (ALA) - 25pts, 13rebs, 1ast, 11/18 FGs. Arwind Santos (SMB) - 22pts, 16rebs, 4asts, 4blks, 3stls, 4 triples.